I usually make dinner 4 out of 5 nights during the work week, and while that seems like a chore to some, I love it. I get excited about going home and whipping something up. (And, the fact that I have a new gorgeous kitchen to come home to doesn't hurt.) The challenging part is to put together a meal in about 30-40 minutes give or take. I don't want to spend hours cooking after a long day, and no one at Chez Gourmess wants to wait until 9 p.m. to have dinner. So, I've become quite the pro at prep and planning ahead. During times like these, creative cookery comes in very handy. I had a pork tenderloin that I had planned to make for a lovely Sunday dinner. I was going to slow-roast it with apples, bacon, and fennel, and serve it with butternut squash macaroni and cheese, fresh-baked bread, and a kale salad. It would be an all-day cookery production, perfect for a lazy Sunday -- not a weeknight. But, on my way home from the office last night, I started thinking about how good the pork would taste for dinner. I know that a boneless tenderloin doesn't take long to bake in the oven, but I didn't want to use the oven. I decided to try it on the stovetop instead. I'd brown it and then finish cooking it in some kind of sauce. I ended up with a tender and juicy piece of pork that I cut up and mixed into a tangy orange sauce that could compete with the best takeout in the neighborhood. Served with veggies over brown rice, it was the perfect meal to end a long, exhausting workday. Remove any excess fat and the white membrane from the pork with a sharp knife. Pat pork dry. In a small bowl, mix together a pinch or two each of salt and pepper, the ginger powder and 1/4 tsp of the garlic powder. Sprinkle all sides of the pork with the seasoning mix. Heat the olive oil in a dutch oven (or a large pot w/lid) over medium heat until it shimmers, then carefully add the pork and brown on all sides, about 10 minutes total. While the pork is browning, whisk together the orange marmalade, soy sauce, minced ginger and garlic, the remaining 1 tsp garlic powder, the sesame oil, the vinegars, a pinch or two of red pepper, a squirt of sriracha, and the chicken broth in a small bowl and set aside. Chop the kale into bite-sized pieces, and seed/chop the peppers. Set aside. Using your tongs, remove the pork and let it rest, covered with foil, about 10 minutes. Swirl in the butter into the pan with the sauce and stir until melted. Add the peppers and kale to the pot and cook uncovered on low heat, stirring every few minutes, while the pork rests. When the 10 minutes of resting are up, cut the pork into 1/4" slices, then cut those slices into smaller pieces. It should be slightly pink in the center, if all went well. 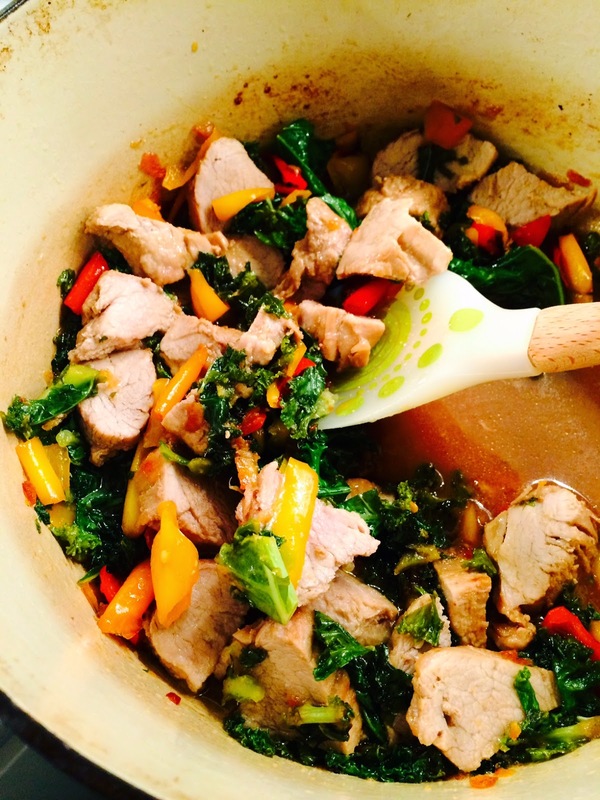 Return the pork to the pan with the peppers/kale and mix until everything is heated through, 1-2 minutes max. Season to taste with salt/pepper. 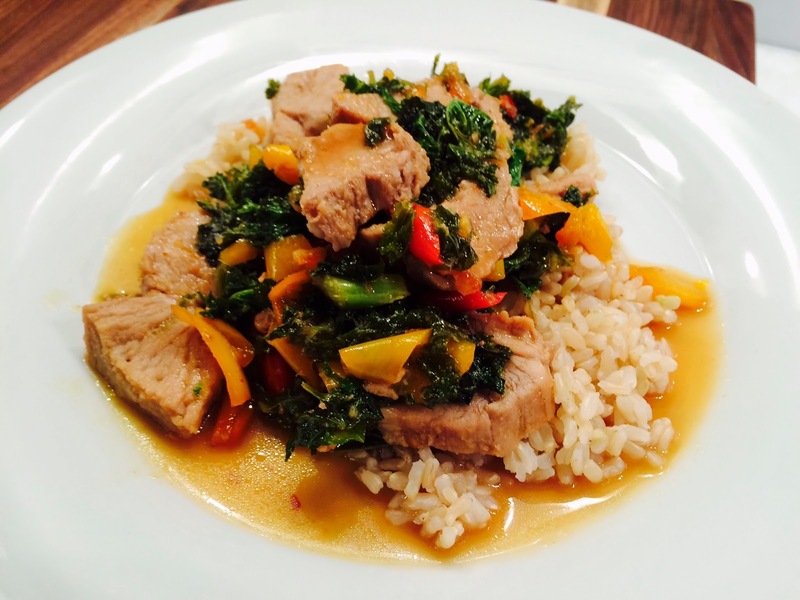 Scoop the pork mixture onto a mound of brown rice and spoon the extra sauce over it before serving.